In July-September 2017 we walked 1400km along the Rabbit-Proof Fence from Mogumber Mission (formerly known as Moore River Native Settlement), just outside of Perth, to Jigalong in the Pilbara, Western Australia in the footsteps of Molly (14), Gracie (11) and Daisy (8), whose stories were told in Doris Pilkington's book, Follow The Rabbit Proof Fence. 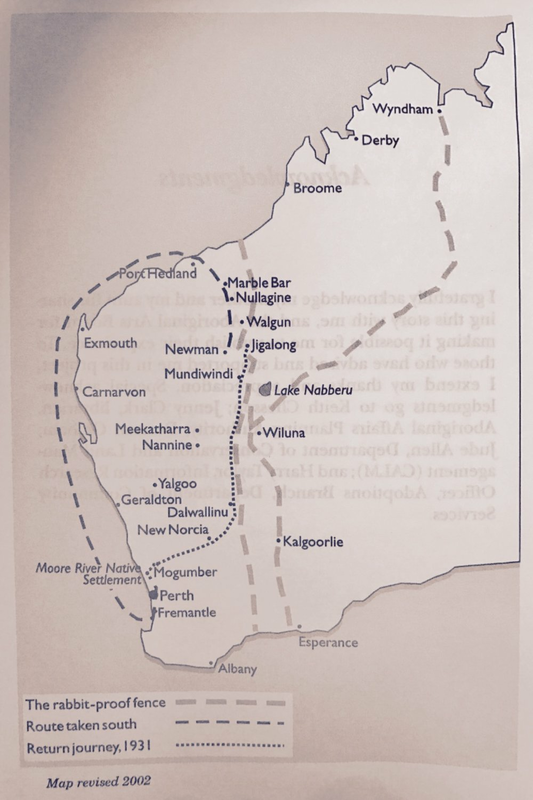 The three young indigenous girls escaped from Moore River Native Settlement in 1931, following the fence across the state to return to their families in Jigalong, who they’d been forcibly removed from as part of the Aborigines Act of 1905, Western Australia. We walked the route the girls took to get home including crossing the Little Sandy Desert from South to North. This is 1400km, mostly along the fence. The girls walked 1600km as they backtracked and walked in circles to cleverly evade trackers and police. We walked at the pace the girls walked, completing between 20-30km per day. We walked this walk and are sharing our story with the blessing and support of Molly and Daisy's descendants, the Pilkington family. We liaised with the Traditional Owners of the land we passed through for their permission to do so. We had relevant permits. We liaised with the station owners whose properties the walk route passes through. We towed a cart with our water, food and shelter supplies, in contrast to the girls. We continue to study the book and aim to share our experience, research and track notes. This walk is about women connecting with themselves and with each other, together, as they walk this significant story in Australia’s history. Molly, Gracie and Daisy completed a heroic feat at a young age. They demonstrate the courage of women and their ability to achieve anything for their purpose and what they love, in this case, family and home. This walk is an invitation for us all to follow the rabbit proof fence and learn about the role we can all play in reconciliation in Australia today. Rabbit Proof Fence Walk started with a white-Australian woman of first-fleet heritage exploring her own role in reconciliation. Following the rabbit proof fence has led to exploration of a period of Australia’s history that needs to be remembered and it’s impact on Indigenous and non-Indigenous Australians today. Molly, Gracie and Daisy’s stories are relevant today as Australian Aboriginal children continue to be removed from their families. Following the rabbit proof fence has led to conversation between Indigenous and non-Indigenous women about what respect, culture, permission, language and Australia means to each of us. We started the walk at Mogumber Mission (formerly known as Moore River Native Settlement) on Saturday the 15th of July, 2017. We arrived in Jigalong on the 21st of September, 2017. Doris Pilkington invited us in her book title of her mother's and aunties' story to Follow The Rabbit Proof Fence. It is a powerful story and people, both indigenous and non-indigenous, and from across generations have come together to gift their energy and skills to enable this walk to happen. We are not all walking, but we are all following the rabbit proof fence! Sarah Hyde made the commitment to follow the rabbit proof fence in February 2016. The team has grown and is growing and you are invited to please join us. Sarah Hyde is an Australian woman of colonial decent. She was born on Kuringgai country in northern Sydney and her family is from the Blue Mountains. She has lived and worked in the Australian outback including Alice Springs and the Pilbara. Sarah has been involved with the Grandmothers Against Removals and met some of Molly's family at a women's meeting in Canberra. She is a member of Desert Discovery and spent 5 weeks in the western deserts learning about Indigenous science and tracking from the women Rangers of Kiwirrkurra, Australia's most remote community. Sarah is learning Pintupi-Luritja and more recently, Mardu. She was a Brownie and Scout and is more comfortable under the stars and canvas than a roof! She helps out at Scout camps in NSW as an adult volunteer. Sarah currently lives in Manly and works as a Speech Pathologist and Associate lecturer at Sydney University.